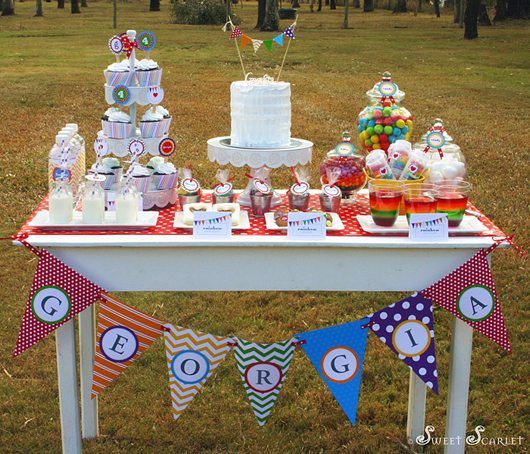 I can't tell you how excited I am that this Dessert Table has been featured on Amy Atlas' Sweet Designs Blog as a guest feature. 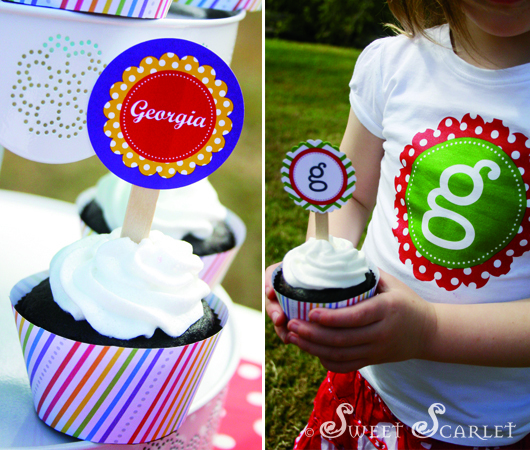 Thank you so much to Amy and staff for featuring my little party! 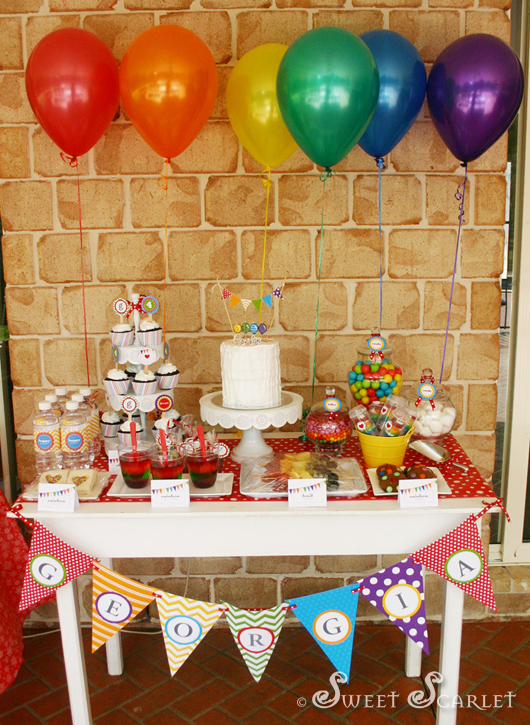 I created and designed this dessert table and set of "Rainbow Bunting" DIY Party Printables for my daughter, Georgia's 4th birthday party which was held at our home two weeks ago. 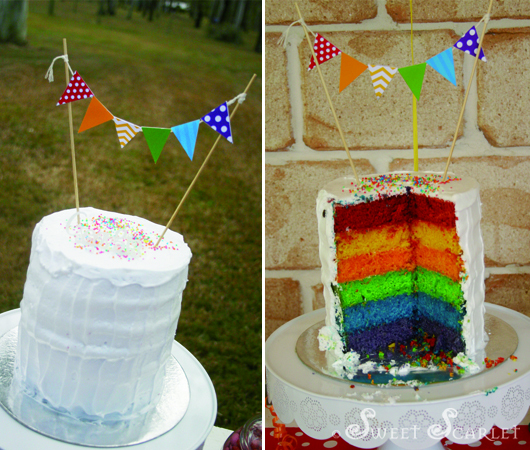 The inspiration came from Georgia herself who loves all things rainbow, and me wanting to make a layered rainbow birthday cake. 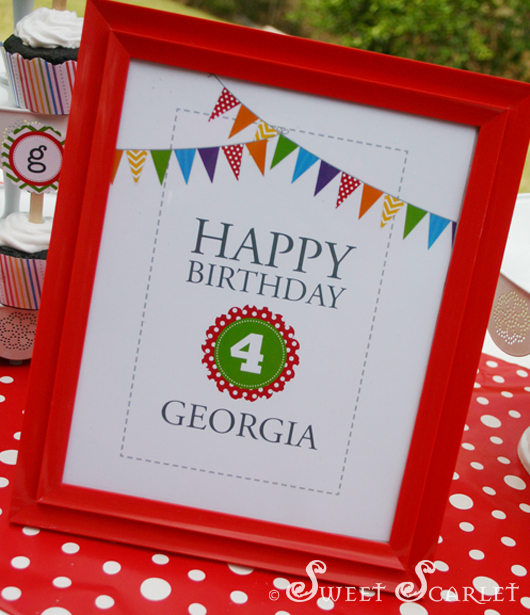 Georgia had a lovely time, and although we had to move the whole table after the initial set up due to the prospect of rain and windy weather, the party was a great success and I was very happy with the outcome. 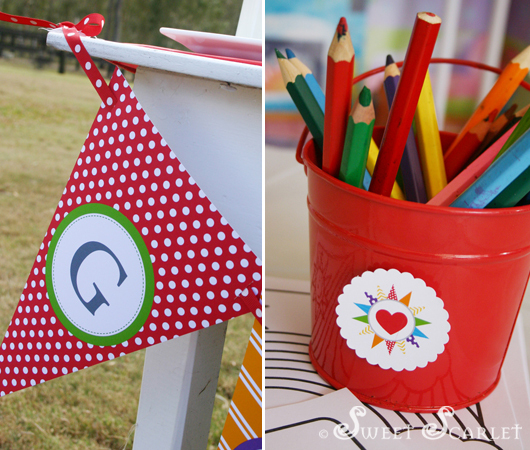 The guests were entertained with a rainbow colouring-in station, pinata and pass-the-pinwheel, a variation on pass-the-parcel. They also had a great time playing on Georgia's new swing set which she received for her birthday. 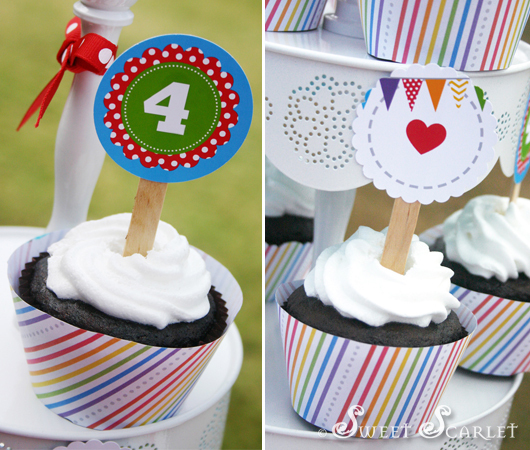 This DIY Party Printable set is now available in my Etsy shop. 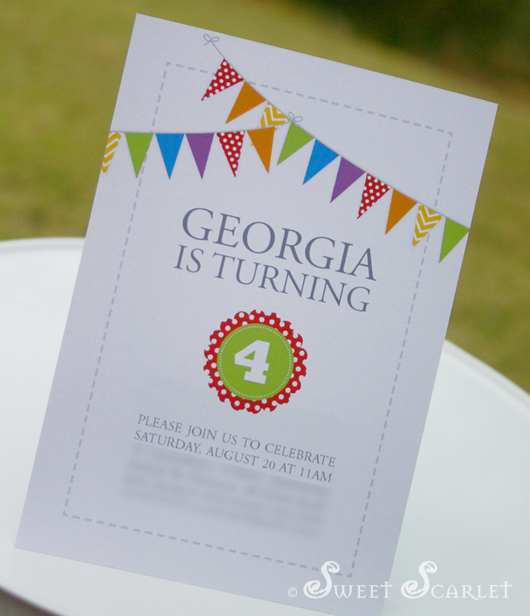 Just download, print & create! I hope you enjoy this party which I had so much fun dreaming up! 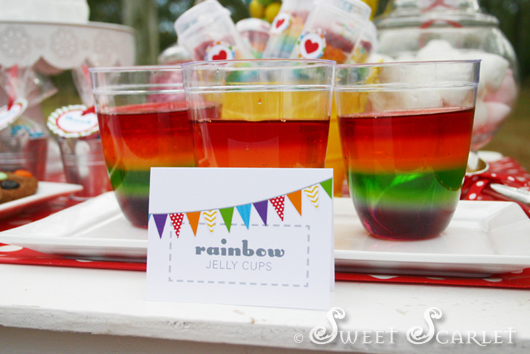 These Rainbow Jelly (Jell-O) Cups took me two days to make! 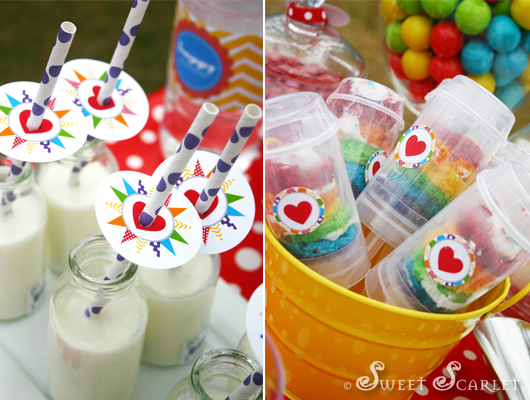 I used 2" Party Dots as straw circles on the mini milk bottles & the push cakes were a big hit with the kids. 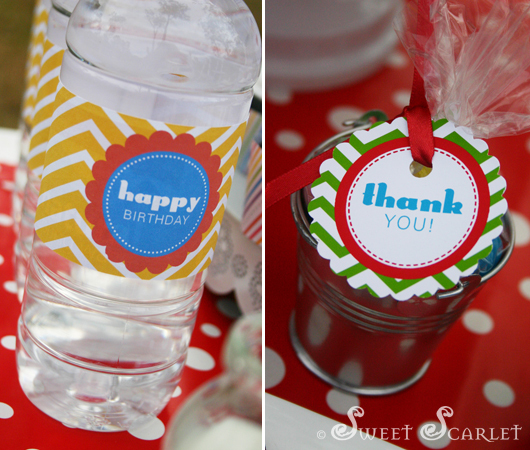 Drink wrappers and party favour dots. Where the dessert table finally ended-up under cover. 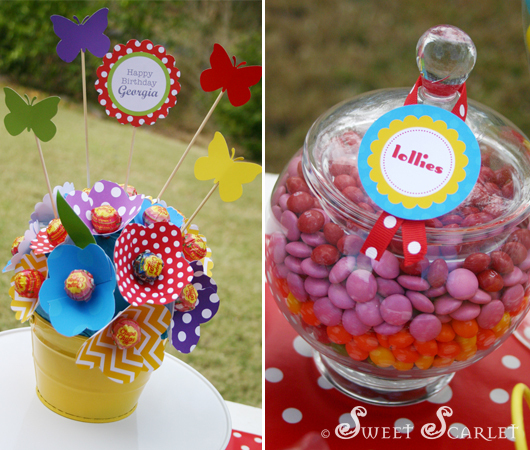 The helium balloons really brought some fun to the table and are a easy and inexpensive decorating idea. 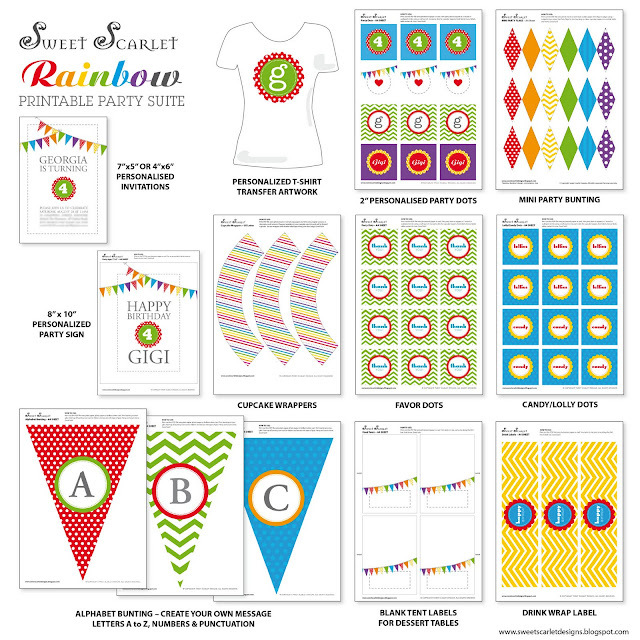 Labels: "rainbow birthday party", "sweet scarlet designs"
Your table turned out so cute! 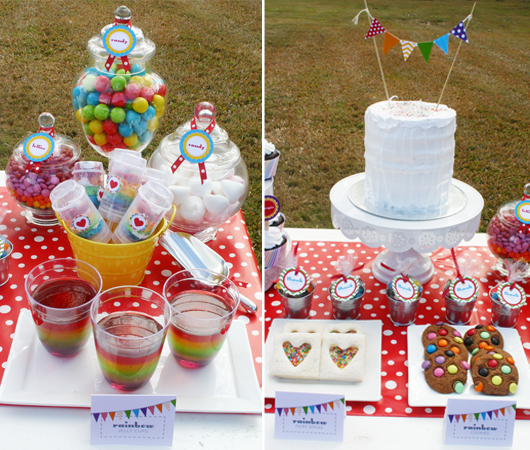 I'm sure your daughter absolutely loved it :) I recently had a rainbow dessert table as well - also with a balloon backdrop! Please helpe. I like that container push up where you put cupcakes. Where can I get some similar? Oh thank you I'm going to see it. I've just see this because you replay was in my gmail and is a new mail so I didn't see before. 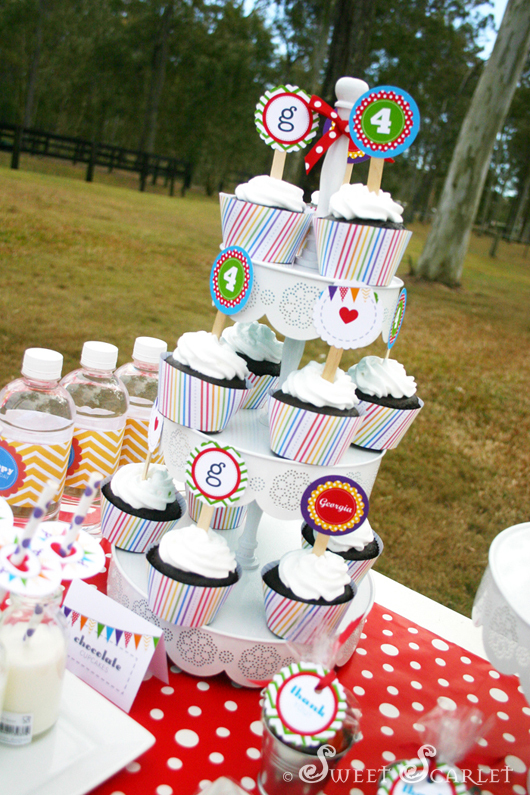 Rainbow party is a great idea for children birthday party. All the pictures are looking very colorful. Thanks for sharing the blog.